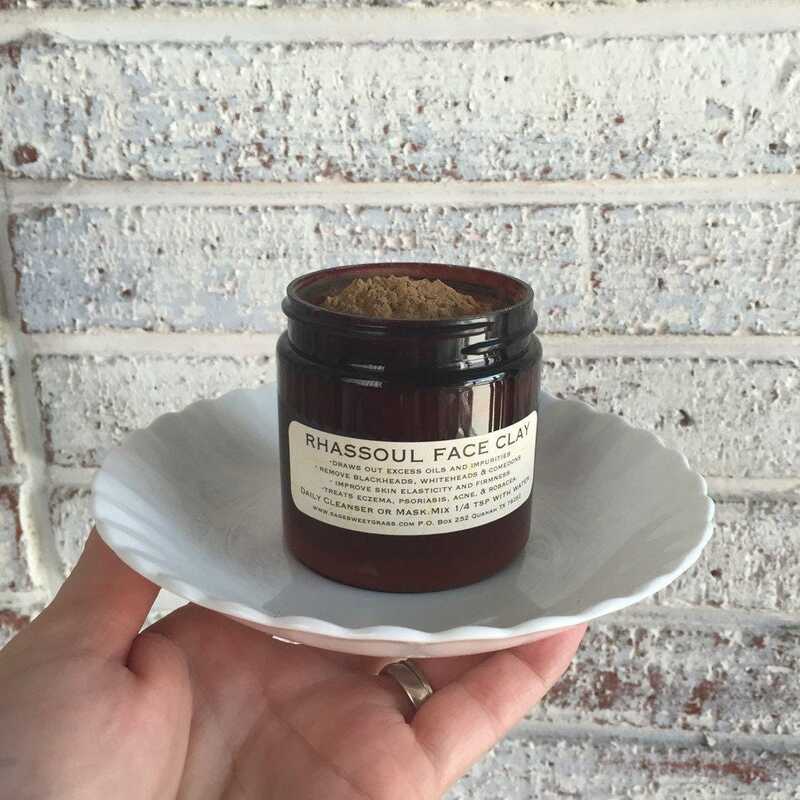 Our Rhassoul Face/Scalp clay is a very rich in natural minerals that improves skin's elasticity, clarity & overall health. It’s gentleness is beneficial for all skin types. Rhassoul clay works by naturally drawing out the toxins that lie just beneath the skin's surface that can lead to congested pores, breakouts even problematic skin such as Eczema and Psoriasis. 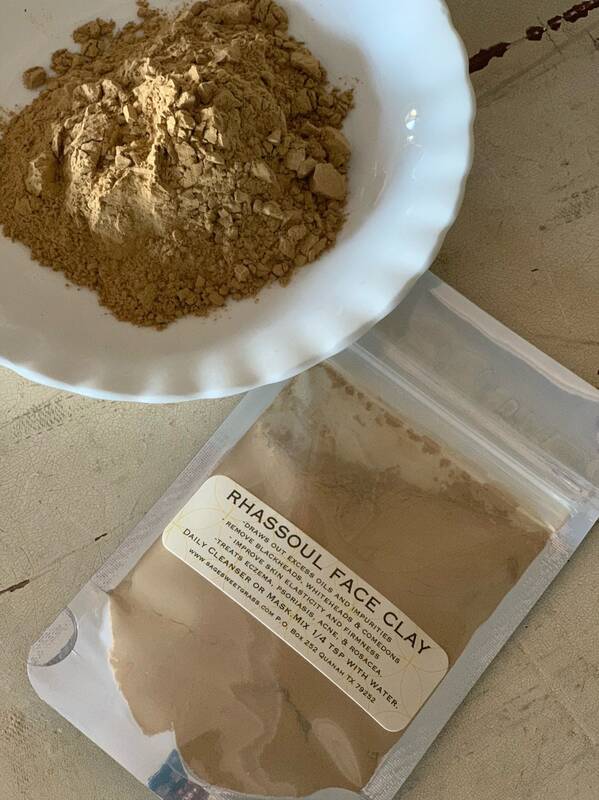 Furthermore, the silica naturally found in Rhassoul clay is known as the "beauty mineral" due to it's ability to reduce dry flakiness and restore skin's natural elasticity. For centuries, women have used natural clay to cleanse their hair, remove excess oil, provide volume and restore shine. To use as a scalp/hair treatment read instructions below. Clay has a natural negative charge so when mixed with water it will attract & pull out toxins from the body that have a positive charge. So be sure to mix your facial clay with a non-metallic spoon in a glass or non-metallic bowl. Also be sure to never store dry clay in a metallic container. Mix a small amount of dry clay with pure water or liquid of your choice. Aloe vera gel is another nice option or even organic yogurt with a bit of honey. Always add just a bit of liquid to form a thin paste. You can add more if needed. You may add 1-3 drops of your favorite essential oil appropriate for your skin type. Lavender essential oil is always a nice addition for most complexions. Tea tree can be used as well especially with acne prone skin. Apply wet clay mixture to face & neck avoiding eyes. You may use as a facial cleanser by massaging skin gently then promptly rinsing. To use as a mask coat skin with a thin layer then leave on for approx. 5-10 minutes based on skin type. Generally the rule of thumb is to allow the outer layer of clay mask to dry but not to the point of flaking off. This can dry out skin too much especially if you already have a dry complexion. Wash face gently with a soft cloth and pat dry. If you are in a hurry but need a quick spot treatment for blemishes.. just dab a bit of the wet mixture to problem area. Allow to dry for approx. 5 minutes then rinse well. To use as a scalp treatment: follow instructions above gently massaging wet mixture into scalp. Leave on for 5 - 10 minutes rinsing hair/scalp well with warm water. You may follow with a natural shampoo/conditioner but it's not necessary. Frequency for use depends on the nature of your skin, generally 1-2 x weekly is a good regimen especially if skin is excessively oily. This listing is for a 2 ounce jar or a 1 ounce pouch.